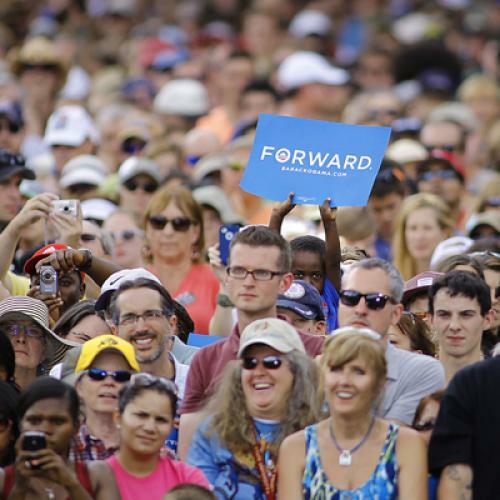 Who Are Obama’s 47 Percent? While tax policy analysts dive into the details of the 47 percent of Americans who don’t pay federal income taxes, it’s also worth examining whether Romney’s right about the 47 percent of Americans who support the president’s reelection. Surely not all Democrats fit Romney’s caricature, but are Democrats the party of indolent free-loaders? Romney might be surprised to learn that the two parties share a relatively similar and relatively representative economic and educational profile. Many demographic fissures, like race and religion, truly divide Democrats and Republicans, but income, education, and dependency just aren’t among them. According to a Pew Research study based on polls conducted in 2012, Democrats are, indeed, slightly poorer than Republicans. 18 percent of Democrats make less than $20,000 per year compared to 11 percent of Republicans, although some of the difference might be attributable to age. But an overwhelming majority of self-identified Democrats and Republicans belong to the middle the class or higher, and the two parties generally resemble the broader profile of registered voters. Although income doesn’t neatly divide the two parties, the demographic composition of less fortunate partisans differs greatly by party. The following map limits the 2008 election results to counties where median income is less than $30,000 per year, and it reveals Democrats performing strongly among Native Americans scattered in reservations across the northern plains and southwest, African American communities arching across the midland South, and the Hispanic voters lining the U.S.-Mexico border. But Republicans perform well in the impoverished communities of the upland South, stretching from eastern Kentucky to west Texas. On balance, these counties voted for Obama by a 52-47 margin, just slightly less than his 53-46 national victory. And Republicans do not possess a monopoly on the “makers,” either. A look at the nations richest counties and best-educated counties shows Obama performing better than he does nationally. But there are stark regional differences: Obama dominated the affluent and well educated metropolitan areas of the eastern and western seaboards, as well as the resort communities that dot the Mountain West, like Sun Valley, Park City, Jackson Hole, and Aspen. But Romney dominated the conservative suburban counties ringing Southern and Midwestern cities like Atlanta, Dallas, Houston, Indianapolis, Milwaukee, and Minneapolis. But are Democrats more dependent on the federal government, despite a similar economic profile? Here the numbers are less clear, but a Maxwell survey showed that 55 percent of Republicans have used a government program compared to 65 percent of Democrats and Independents. Again, this isn’t a tremendous difference, especially since “government program” can include programs perceived as serving the “undeserving poor” like welfare and food stamps, as well as more popular entitlements like Medicare, student loans, or unemployment insurance. The partisan affiliation of the voters who don’t pay federal income tax is even less clear, especially since many voters who don’t pay the federal income tax still contribute payroll and state taxes that might lead them to believe they do pay federal income taxes. Of the 47 percent who don’t pay a federal income tax, 53 percent make less than $16,000 per year. In 2008, voters making less than $15,000 per year voted for Obama 73-25, perhaps aided by a strong turnout among low-income African Americans or extremely young voters. But while a disheartening 20 percent of Americans make less than $16,000 per year, they represented just 6 percent of the electorate in 2008. Put differently, Obama still would have received 52 percent of the vote if none of these voters had participated. Thus, while individuals making less than $16,000 per year and without federal income tax liability represent a surprising share of the population, low turnout ensures that they only exert the slightest tug on the outcome of presidential elections, for better or worse.